Gerald McRaney makes everything better. After the episode five cliffhanger with Ron and the Ball-leg Knights, I was really looking forward to episode six. 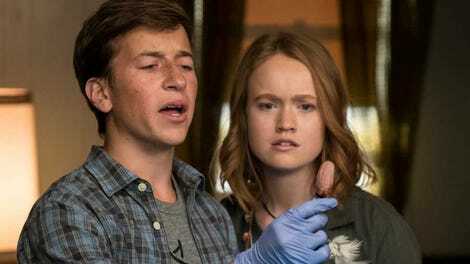 Unfortunately, the Santa Clarita Diet writers dropped that thread for now and instead circled back to the Japopo’s receipts, which is fine because that was a lead worth exploring, but the whole episode felt a little off. Separately, the plots were OK (some better than others), but the whole was not greater than the sum of its parts. It’s like the writers needed to buy some time because they didn’t have quite enough to fill 10 episodes, so this was the midseason wheel-spinning installment. It’s not that seeing the Hammonds do every day things is bad—it’s not; they’re still people who have jobs and school and stuff—but all the moving parts just didn’t gel together. First, Joel went off on his own to find the one other person who ate the clams on the infamous Friday at Japopo’s. Gerald McRaney plays said man, Col. Ed Thune, and McRaney is his usual awesome self. That man is a national treasure and he makes anything better. His menacing behavior coupled with Joel’s constant worry that Thune is a zombie was a funny bit, but the climax of the meeting, where the two men fight because (surprise?) Thune is a zombie and he’s going feral, tried to incorporate Joel’s subplot of volunteering to teach Deputy Anne how to tango and that just felt way too sitcom-ish for this show. I expect better of the writers. It also didn’t tell anyone much of anything, at least not yet. So it feels like all of that could have been handled a little quicker on the show. Sheila, meanwhile, is working with Carl to woo an investor for the big housing development and she’s encountering some major stress because Carl doesn’t like bold new Sheila. He wants her to smile more and laugh at his jokes and back up all his ideas and basically be the simpering woman that so many awful men think women should be. Again, not a bad idea on paper, but the execution wasn’t great. To combat her urges to rip Carl’s throat out, Sheila chews on her fingernails until she almost bites one finger clean off. But that’s it. Sheila didn’t stand up for herself, nor did the show make some really clever, pointed commentary about women in the workplace. Sheila makes one comment to Joel about how it’s going to be hard to be undead and have a successful career and once again, her zombieness is standing in for how hard it is to be an assertive woman in many working environments, but the show didn’t really explore that enough to make this storyline meaningful. It all could have been a bit sharper, instead of feeling like a big set-up for when Sheila inevitably kills Carl (I will eat my hat if that’s not how this turns out). Finally, in the strongest thread of the episode, Abby has a date with Sven, which doesn’t go especially well. He wants to get to know the real her, but when she reveals that she enjoyed the pain she inflicted on Christian when she whacked him with the lunch tray, Sven looks a little horrified. It kind of parallels what her mom is going through with expectations for women and their behavior, but I don’t get the impression that Sven was horrified by it because Abby is a girl. I think he was horrified because that’s kind of dark and not what he would be expecting from anyone, girl or boy. The only bright spot in the date is that Abby uses Sven’s fancy camera to take pictures of the fracking site she wants to protest and it takes her back to Eric, both because he’s the only person she can be herself around but also because Eric is down for whatever when it comes to her and she has designs on vandalizing a billboard at the site. Abby and Eric are great together. Their friendship has been very well written and I think when they do finally get together romantically (if they do, which it’s also fine if they don’t), it will be so genuine—a lot like what Joel and Sheila have. 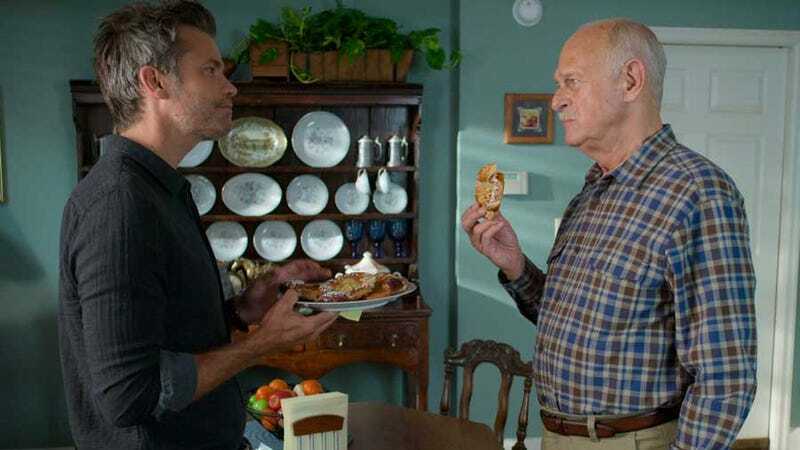 Abby and Eric also managed to save an episode that was otherwise not great, something I can’t believe I think that about an episode involving Gerald McRaney, you guys. Maybe the clam special connection has nothing to do with Japopo’s. Maybe it’s the seafood company? Or a seafood uprising? Attack of the Killer Mollusks. Joel’s Yelp review of Japopo’s: “If you like capers, try a Marx brothers movie because you won’t find any in this piccata!” Joel is exactly my kind of dad-joke funny. Can we please meet Joel’s cold, domineering father? Maybe in season 3? I’m already mentally casting the Hammonds’ parents. I feel like the one-two punch of Ted Danson and Mary Steenburgen would be amazing as Joel’s parents, plus that’s a small Justified reunion! Carl: “I love the hair, by the way. You look like an attainable Jessica Rabbit.” Good lord.